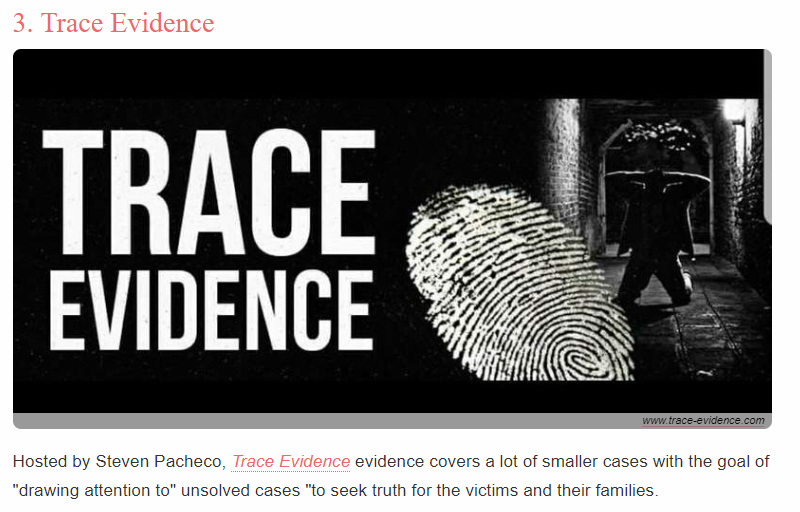 Trace Evidence has been featured on lists and in articles by several websites and companies including Vox.com, Investigation Discovery, Oxygen, Women.com, WhatPods, True Crime Magazine and Inquisitr. Thinking of including Trace Evidence on your website? Trace Evidence and host Steven Pacheco were mentioned by Aja Romano of Vox.com as she discussed attention given to victims in her article “Netflix’s Conversations with a Killer willfully participates in Ted Bundy 3-ring circus” about the Netflix Ted Bundy documentary. Trace Evidence was listed by Oxygen.com as one of the "7 True Crime Podcasts You Should Listen to Right Away" in March of 2018. Trace Evidence was listed by WhatPods.com as one of the Best True Crime Podcasts. True Crime Magazine listed Trace Evidence's Episode 14 - The Disappearance of the Beaumont Children in an article "What Really Happened to the Beaumont Children" covering the children's disappearance. Inquisitr.com wrote a glowing article about Trace Evidence - Episode 037 - The Disappearance of Danielle Stislicki in their article titled "True Crime Podcast Thoughtfully Covers Michigan Woman's Mysterious Disappearance." 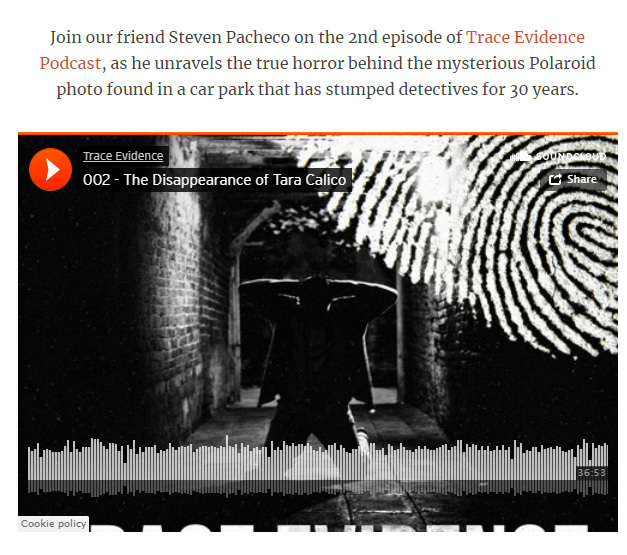 True Crime Magazine listed Trace Evidence - Episode 002 - The Disappearance of Tara Calico in their article "The Infamous Mystery Polaroid Photo" about the case. In their article "Ad Large Strike Killer Deal," Radio Ink Magazine specifically acknowledged Trace Evidence as a standout show on the Murder.ly True Crime Network. True Crime Magazine discussed Trace Evidence - Episode 039 - The Mysterious Death of Elisa Lam in their article "Did Someone Get Away with Elisa Lam's Murder?" Women.com listed Trace Evidence #3 on their list of the "27 Best True Crime Podcasts."